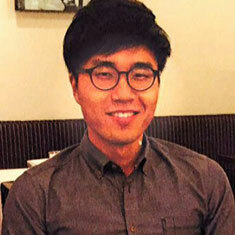 SHIN Receives Benenson Award in the Arts! Jaewook (Jay) Shin (T 16, HDV 16) has received the prestigious Benenson Award in the Arts from the Benenson Award Committee. The title of Shin’s project is Music as Medicine –Bringing Music to Residents at Durham Nursing and Rehabilitation Center. During his postgraduate year (2016-17) while he is also working on a master’s degree, Shin will be working with a local nursing home—Durham Nursing and Rehabilitation Center—to introduce targeted music to the residents there. According to his Benenson Award Recommendation, Shin, “…strongly believes that the long-term care residents at the DNRC have significant holes in their lives that can be filled with music, and that they can benefit psychologically and socially from this intervention. His ideas are supported by a growing literature that shows the remarkable impact of personalized music on older adults with dementia.” Shin will be developing personalized music interventions to see if there is an impact on quality of life. 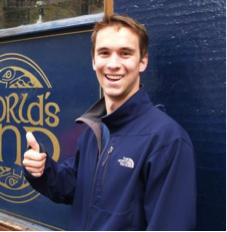 Eric Emery (T 13, HDV 13) has just had his senior thesis accepted for publication by the Yale Review of Undergraduate Research in Psychology. This annual publication selects the best and most original psychology research from undergraduates around the world. Emery’s Human Development/Senior Honors Thesis work was supervised by his faculty mentor Sharron L. Docherty, PhD, PNP-BC, FAAN, an Associate Professor in Duke’s School of Nursing. Emery is currently a Research Assistant at the National Institutes of Health. A curriculum emphasizing the complimentarity of biological, biomedical, psychological and sociological disciplinary perspectives. A research apprenticeship with a Duke faculty member. Skills in the conceptualization, implementation, evaluation and communication of developmental research. Note: The Undergraduate Program in Human Development offers a certificate. It does not offer a major. A total of six (6) courses is required to complete the curriculum for the Certificate in Human Development. These courses are described in the Undergraduate Bulletin and are listed below as well. Two (2) elective courses from the list of biological, psychological, and sociological courses affiliated with the HDV Program and listed below. The research apprenticeship provides an unusual opportunity for students to develop skills and participate in a research experience. The HDV Program identifies and matches students and mentors. Research findings are reported in the Senior Seminar. Pre-medical and pre-law students as well as majors in the social and behavioral sciences have worked successfully on developmental research in labs, clinics, and programs at Duke and elsewhere. Previous topics include the following: abortion, addiction, adult cognitive styles, aging, cell change, depression, divorce, health services, immune system change, moral judgment, premature infants, retirement, self-concept, sickle cell anemia, and talented youth. Students should register for HDV 124 during their sophomore year and begin planning for their apprenticeships at that time as well. Research papers from the apprenticeship are sometimes revised for presentation at scholarly meetings or publication in scientific journals. **NOTE: Students may count ONLY two (2) courses toward both their major and their Human Development Certificate. 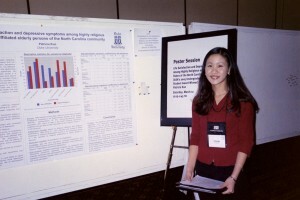 Patricia Kuo (Psychology, 05; Human Development Certificate, 05) was recently awarded the American Society on Aging’s Undergraduate Paper Award. 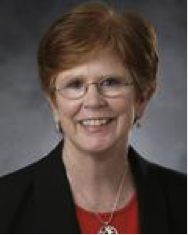 Patricia, under the guidance of Professor Judith C. Hays of the School of Nursing and the Aging Center, did research using the Duke EPESE data and submitted her paper, Life satisfaction and depressive symptoms among highly religious and non-affiliated elderly persons of the North Carolina community. Her award was presented at the 2005 Joint Conference of the American Society on Aging and The National Council on the Aging in Philadelphia in March 2005. Regi Holman (Sociology, 05; Human development certificate, 05) won the Ida Harper Simpson Undergraduate Writing Award from the Department of Sociology for 2005. Regi’s paper was entitled, My Daddy Wants Tenure: Academic Family Men, the Normative Expectations of Today’s Family, and Implications for Current University Family Policy. Regi completed her human development research with Professor M.E. Hughes of the Sociology Department, and her research apprenticeship paper was entitled, the rich get richer: a study of education differentials in marriage.